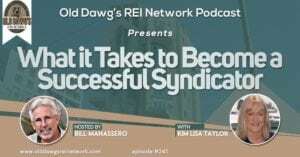 In a second appearance on the Old Dawg’s REI Network Podcast, Kim and host Bill Manassero explore some of the more important details involved in becoming a successful syndicator. From her experience both as a leading syndication securities attorney and as a real estate investor herself, Kim shares practical, easy-to-understand tips on how you can both learn and become successful as a real estate syndicator. You can access the complete transcript by clicking here. For Show Notes from the Old Dawg himself, click here.